One of the first under pressure, Paul Nicholls' Triumph Hurdle winner was a good five lengths down at the second-last, where Darlan and Tony McCoy took a crashing fall. Sailors Warn and Sire De Grugy appeared to have it between them, but the likes of Raya Star, Get Me Out Of Here and Olofi were closing fast. Zarkandar (11-4 favourite), having his first run of the season, began to stay on very powerfully and Ruby Walsh guided him through a small gap to win by a length and a quarter. Get Me Out Of Here, who was badly hampered by the fall of stablemate Darlan, finished second, with Raya Star and Sire De Grugy taking minor honours. Nicholls said: "There is huge improvement in him between now and Cheltenham. I had him right today, but I was training him with Cheltenham in mind. I was worried about his lack of experience, but he's progressive and keeps winning. He needs to improve, but he worked great two days ago and he always gallops to the line." With Walsh set to partner last season's Champion Hurdle winner Hurricane Fly at Cheltenham next month, Daryl Jacob is likely to be back on board Zarkandar. "Daryl will ride if Ruby rides Hurricane Fly and Daryl will be waving goodbye to him on the run-in!" joked Nicholls. Walsh said of Zarkandar: "I kind of knew there was going to be no pace on but, in fairness to a horse with only three runs, I didn't see any of the first four hurdles, so there was no way he did either. He jumped impeccably and stayed on really well in the straight. "He's the first horse in 40 years to win this race without a prep run, and that says enough in itself. 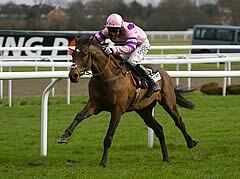 He showed what you need to win a Champion Hurdle - stamina. He outstayed them and pulled up when he got to the front. He's going to improve a ton for the experience of the race, but time will tell." After having treatment from on-course medical staff, McCoy later walked away from the incident at the second-last.